First you preheat your oven to 180°C, grease your springform pan and line its bottom with some parchment paper. Put the eggs and a generous pinch of salt in a bowl and whisk them up. In another bowl you mix together the flour, sugar, baking and cocoa powder. Next you melt the dark chocolate and finely grate the red beet. Please wear gloves while working with red beet or you will end up with heavily colored fingers! Now you mix the grated red beet with the melted chocolate and the neutral oil. Pour this over your flour mixture and stir until completely combined. Then you gently fold in the beaten eggs and pour the batter into the prepared springform pan. Bake the cake for approximately 45 minutes. Then take it out of the oven and let it rest for a few minutes, before you take it out of the springform pan and put it on a cooling rack. When the cake has come to room temperature, you can continue with the decoration. Therefore you melt 150g of dark chocolate and combine it with a tablespoon of coconut oil and 50ml of almond milk. Then you add maple syrup to your taste and pour the mixture over your cake. Just let the chocolate run over the edges. Once it starts to set, you can garnish you cake with red beet powder and some chopped chocolate. You can easily do the red beet powder at home. 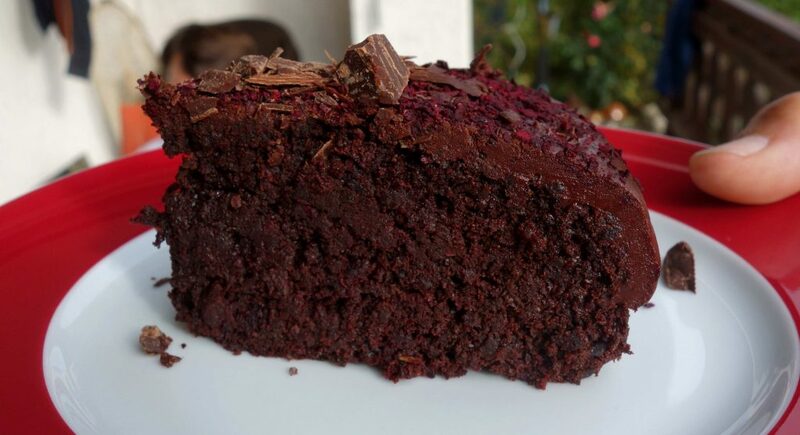 All you need is a few slices of dried red beet and a blender 😉 Okay, now your cake is ready! It is moist and rich in flavor, so go ahead and enjoy it.